Kissing Carp are symbol of luck in Asia - this simple metal bangle is a vintage-chic yet au courant, accessory. Suitable for all ages. Made of silver-plated Zinc Alloy for resilience and longevity - this material also benefits from being hypoallergenic. 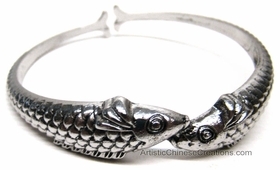 While firm, bangle design does allow for some flexibility. Perfect gift for any woman.